Monumental map of Arabia, Persia and India based on D'Anville. Erster Theil der Karte von Asien welche die Türkei, Arabien, Persien Indien diesseits des Ganges und einen Theil der Tatarei enthält. A monumental and highly detailed 1786 map of India, Persia, and Arabia by the Austrian cartographer F. A. Scharembl. 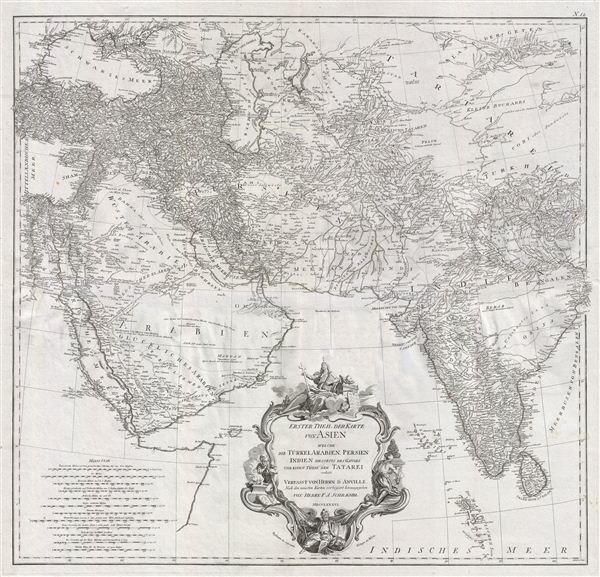 Centered on Persia, this map covers from Istanbul to eastern India and Tibet, and from the Black Sea to the Maldives. Schraembl derived this map from the influential French cartographer J. B. B. d'Anville's similar map of 1751, which here has been re-engraved, updated, and translated into German. If offers excellent coverage of the central Asian portions of the Silk Route naming the centers of Samarkand, Bukhara, Lop Nor, and others. At the bottom center there is a large decorative title cartouche including stylized Christian, Muslim Zoroastrian, and Buddhist elements. Persia at this time was itself experiencing the waning years of the short lived Zand Dyansty who ruled from the capital city of Isfahan – identified here. In a few short years, 1794, Aga Muhammad Khan would overthrow Loft Ali Khan, last Shah of the Zand Dynasty, and relocate the capital to the new city of Terhan. The subsequent era, the Qajar Dynasty, witnessed numerous military conflicts with the rising powers of Imperial Russia and the loss of much of Persia's territory. India meanwhile was quickly falling under the control of the British east India Company who, from a few coastal outposts, were rapidly asserting their authority over most of the continent, leaving only the Sultanate of Mysore, under Tipu Sultan, independent. Two years before this map was issued in 1784, Tipu Sultan negotiated the Treaty of Mangalore following the Second Anglo-Mysore War. Though it only gave Tipu Sultan a short reprieve, the treaty was considered a victory for the people of Mysore. Nonetheless, the Third and Fourth Anglo-Mysore Wars were soon to follow and by 1799 Tipu Sultan had been defeated and all of India fell under the at least nominal control of the British east India Company. Schraembl prepared this map in 1786 for inclusion in his monumental Allgemeiner grosser Atlas. Though many of the maps in this atlas are dated 1786 the atlas itself was not complete until 1800, when it was published in Vienna. A lavish production, the Allgemeiner grosser Atlas was expensive and proved difficult to sell, resulting in a low publican run and considerable scarcity relative to other european atlases of the period. Very good condition. Two sheets, joined. Wide clean margins. Platemark visible. Blank on verso.